Build a decorative yet decorative lattice-work trellis in your garden or yard to support your heavy clematis blooms and enhance the appearance of your yard. Although some varieties of these colorful flowering plants resemble shrubs, many of them are climbers and need support of some kind to lift them off the ground and encourage them to grow upwards. Most climbing varieties bloom from late winter to early fall, adding color to a particular spot far longer than other flowering plants. Determine the appropriate height and width of the clematis trellis. Keep it 5 to 6 feet tall. Measure a height of 6 feet on the wood lattice sheet and extend the point to the other side with a ruler. Cut carefully over the mark with a circular saw or handsaw. Put the lattice trellis sheet on a level ground. Position lengths of miter-cut lattice molding (available in most hardware stores) around the edges of the sheet and hammer them with 1-inch galvanized wire brads spaced 3 to 5 inches apart. Measure and mark a distance of 4 feet on the ground where you want to install the clematis trellis. Dig 2-foot-deep holes at the corners with a post hole digger or narrow shovel. Carefully stand an 8-foot tall 2-by-4 pretreated lumber into each hole, so only 6-foot length is visible. Install three fence brackets in the center of the inside of a post, in a straight line. Space them evenly on a post to ensure one is near the top, the other near the middle and the third near the bottom. Measure the distance with a tape measure and check they are in a straight line. Repeat the same procedure with the other post. Lift the lattice sheet carefully and slide it between the brackets on both the posts until it rests on the flanges of the lowest brackets. Attach with galvanized nails for added stability. 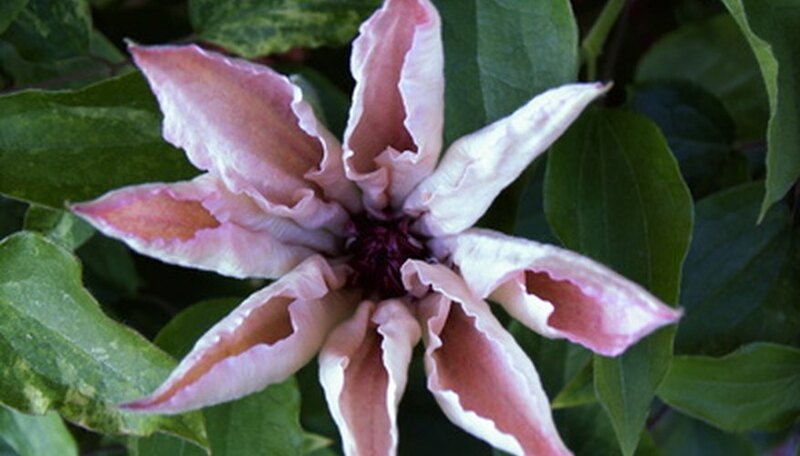 Paint your clematis trellis a bright or natural color to protect it from natural elements. Apply two or three coats, allowing each coat to dry thoroughly in between. Plant your clematis at the base of the trellis and watch growing tendrils climb the lattice sheets to cover it completely and add color to the spot. Alter the measurements of the posts and trellis sheet to suit your requirements. Prefabricated lattice trellis sheets are sold in 4-by-8-foot lengths, so use two sheets if building a trellis wider than 4 feet.